Lance Kearse is NOT playing tonight (inside source). 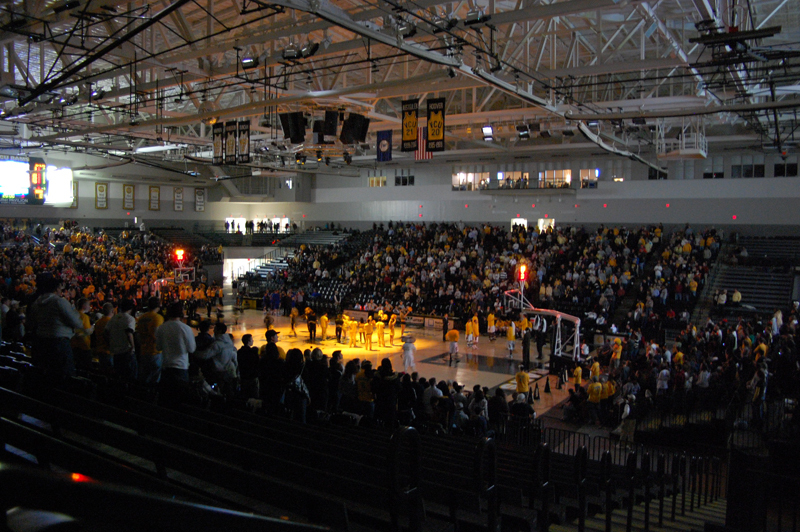 Possible starting lineups – VCU: Larry Sanders, Eric Maynor, Brandon Rozzell, Bradford Burgess, Ed Nixon. SDSU: Kai Williams, Anthony Cordova, Mackenzie Casey, Garrett Callahan, Clint Sargent. SDSU’s Kai Williams is a senior (and from Saskatchewan) and is likely to hit SDSU’s 1,000-point club this year. This is SDSU’s first year as a D1 team, completing their transitional stage last year. The Rowdy Rams are trying to take over the West End general admission section, presumably to get that section to act like they’re at an actual basketball game. Larry Sanders has two big dunks right off the gun. 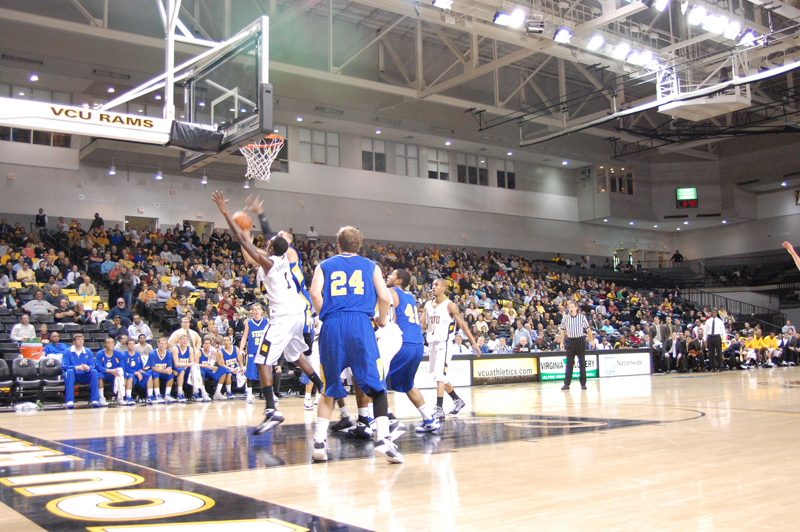 VCU’s speed is throwing off SDSU’s ability to run plays. TImeout: 15:57, VCU 11, SDSU 5. VCU pressure has caused 2 turnovers and 2 traveling calls already on SDSU. Shelton: “This could be a high scoring game… SDSU looks like they’re in a different world right now”. Timeout: 13:31, VCU 19, SDSU 5. VCU on an 8 point run, SDSU is shooting 20% right now, VCU shooting 67%. Maynor takes a seat. TJ wants the ball BAD. Needs to prove he’s better than his last turnover. VCU has only taken two 3-pointers! You can tell coach is getting the team to cut down on forced 3s. Bradford Burgess has 2 boards already. Maynor 3 assists. Team is shooting 66%. Saintil comes in. Eric Maynor makes the first 3 of the night for the Rams, only our 3rd attempt so far tonight. Crowd is loudest it has been this season. SDSU forced to take a time-out on the inbound pass. Ã‚Â SDSU is gonna have a tough time hanging with VCU press, Michael Palarca is noticably tired. Ã‚Â Saintil takes a poor shot attempt under the basket. Ã‚Â SDSU goes on a little run of their own and score is dwindled down to a six point game. Ed Nixon comes out, doctors taking a look at him. Got banged up a little bit on a turnover. Eric Maynor completes an absolutely beautiful drive down the lane. 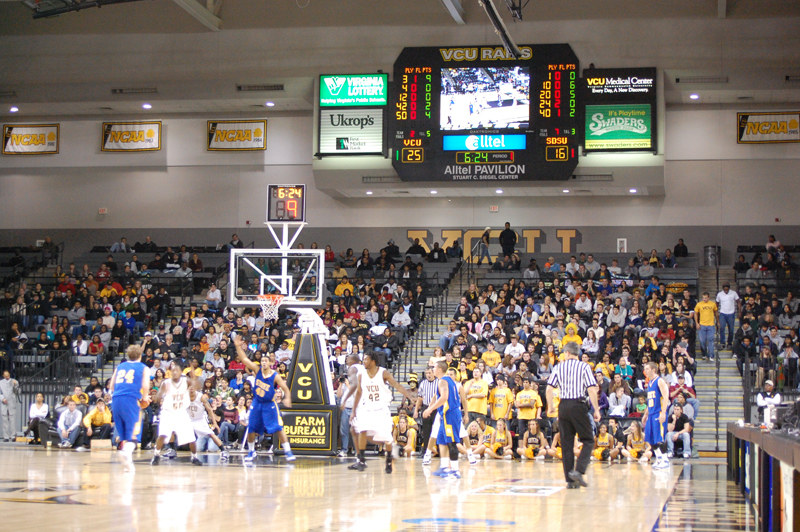 Timeout: 2:34, VCU 35, SDSU 27. Rozzell fouled on a 3. Gets 3 shots, knocks down all of them. Nixon is back on the floor. VCU shooting 53%, SDSU 35%. SDSU kicks back to zone defense. MAYNOR RUNS ACROSS PRESS TABLE TO SAVE BALL, KNOCKS OVER A FEW CHAIRS. Halftime: VCU 38, SDSU 30. All of the VCU dancers are very attractive. 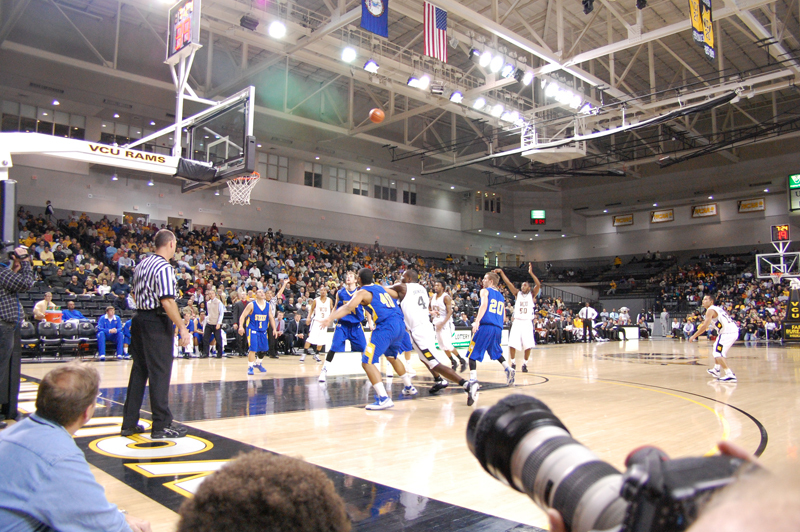 – The opinion of Matt Morton, not VCU Ram Nation. SDSU is shooting 55% from the 3, VCU shooting 29%. VCU is being out-rebounded 21-16. Running Rams come out true to their name. Let’s see if we can Ã‚Â keep this hustle up this time. Ã‚Â Nixon and Burgess get some quick transition baskets. Larry gets block number five. Ã‚Â Crowd motivates with a “Larry Sanders” chant… he rewards with block number six! Ã‚Â Nixon gets 1-2 from the charity stripe. Ã‚Â Solid Defense and SDSU watches the shot clock expire on them. Readers pointed out that Kai Williams is actually a Junior. Good. Because he’s 0-8 right now! Point spread is pretty even for VCU among starting lineup: Maynor 12, Sanders 7, Rozzell 8, Nixon 7. VCU is fighting off the zone defense by run-n-gun offense. Timeout 11:44, VCU 47, SDSU 37. TJ is out on a bad pass, replaced by Burgess. Some of us are getting nervous. SDSU is draining 3s, we are now up by only 5 points. We just learned that ERIC MAYNOR CAN DUNK! Knocked down a 3, then steals the ball for a DUNK. 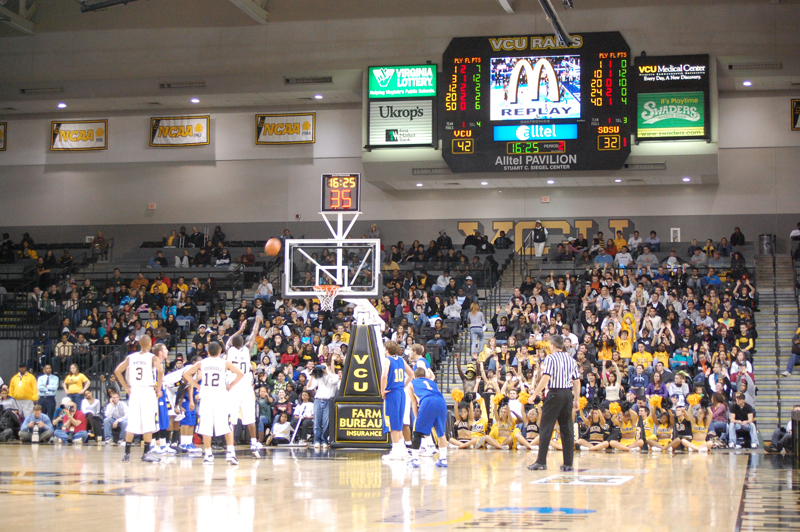 Slightly reminsiscent of VCU GMU CAA TOURNEY?! 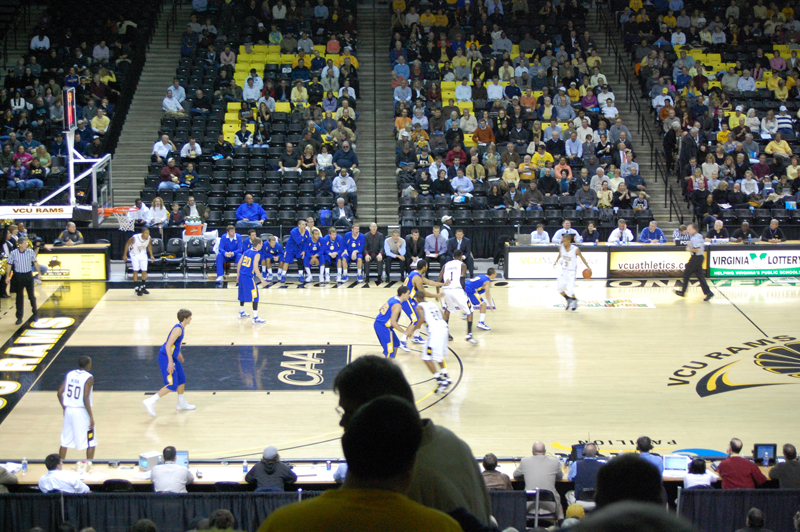 Two really bad calls against VCU… but… it gets this sombre crowd back into the game. Maynor drops his 2nd bucket since coming in, draws a foul. This is becoming the Eric Maynor show. Larry Sanders with a HUGEEEE blocked followed by a HUGEEEE DUNK. This place is going nuts!!! Has two thumbs up to the crowd!!! Crowd is chanting La-rry San-ders! Battery is running low!!! AHhhhh…. Timeout 4:07, VCU 71, SDSU 49. Talk about a burst of energy. Once Maynor came back in, he was explosive. VCU went on a 19-4 run in the past 3:32, about 10 of those were Maynor. A technical foul against SDSU and a furious Anthony Grant gave VCU the edge to come up to a 22 point lead. This crowd, attendance 4,641 sounds like a full house. Props go to Larry Sanders for getting this crowd so involved in the game. Final Score: VCU 72, SDSU 56. Kai is actually a Junior. Keep it up! Good work!! Thatw as a good game!